ShuMin Star(Sensitive Skin Treatment device) is a high-technology beauty medical equipment with China Patent which is developed by us who is the subordinate company of Chinese Academy of Sciences. It is suitable for the treatment of various skin allergy symptoms. YICHAO is the focus on medical equipment and beauty equipment R & D manufacturers. In the Division of science and technology focus on physical and RF research and development for 30 years. The company has a medical product production license, and at the same time with dozens of national patents. Wuhan Xinxin Technology Equipment Co., Ltd. is the only exporter of its designated. ShuMin Star is the most fist treatment device in hospital's dermatological department or beauty spa club. Role in the repair of the skin lipid membrane, thickening of skin keratinocytes, restore skin barrier function, enhance skin resistance. 4.Why you have to choose ShuMin Star? 1.Huge sensitive skin repair market, adequate customer base. The 2016 L'Oreal survey showed that it has a market of 50 billion capitalization. Many people have skin-sensitive problems, but there is no good way to treat about it . 2.The hospitals that own ShuMin's Star machine keep running non-stop, because of too many customers appointments. 3.It's very easy to earn money with ShuMin Star. 4.Very high rate of return. 6.Few competition, for the same price can not buy other equally effective equipments. 7.ShuMin Star can relieve skin sensitivity symptoms 60-70% for a single time treatment of allergic skin. 8.ShuMin Star has high market share in the stat device of Beauty Salon and skin shaping hospital. 9.ShuMin Star get a lot of support and recognition by Chinese experts . 10.ShuMin Star is very cost-effective. It combines the efficacy of treatment and beauty. 11.The treatment feeling by ShuMin Star is very comfortable. The patient who have used ShuMin Star likes it a lot. 12.The usage rate of ShuMin Star in hospital and beauty Salon are very high, no consumables,low cost. 13.ShuMin Star has very high economic benefits. It's very quickly to get back 95% of the cost. The machine works all the time even people work shift. 14.ShuMin Star can lead other instruments combined therapy. For example, ShuMin Star+Radiofrequency can treat all kinds of stains. After using Radiofrequency, the skin will be dry and peeling. After using laser, it will cause skin peeling, dry. The high laser energy will make heavy colors, and take a lot of risk. With ShuMin Star to give the skin moisture, repair the skin. It can ease skin redness, itch and dry caused by laser. 15.ShuMin Star is customer glue. Many customers specifically comes for ShuMin Star. 16.Repair skin barrier function, the only device in the world. In China's top 20 public hospitals dermatology, 17 of them have ShuMin Star. In top 100 private hospitals, more than 95% of them have ShuMin Star. 17.ShuMin Star passed CFDA test. 18.We can provide a full set of treatment-sensitive package. There are thousands of successful clinical experiences in China in four years. You can use the device to reach the limit. 6.Why ShuMin Star can treat sensitive skin?Technology and Principle. 27Mhz eddy current electric field can make the skin local oxygen supply increased 3-5 times, promote blood circulation. 27Mhz eddy current electric field can effectively enhance the phagocytic function of phagocytic cells, relieve inflammation. 3). Repair skin barrier function. Most of the sensitive skin has symptoms of impaired skin barrier function. The skin is brick wall structure. The skin barrier is damaged like a thin brick wall. At this point for the outside world of various stimuli, bacteria, fungal virus resistance is reduced. And 27Mhz eddy current field can be local skin potassium concentration decreased, rapid increase in calcium concentration, rapid repair of the skin barrier function. 27Mhz for the reconstruction of the skin barrier function is recognized worldwide technology. 4). Give a lot of water to the skin. The water ion generator ionizes the common water molecules into charged ionic water by displacement current. This active ionized water is more easily absorbed by the skin, so the skin moisture complement is greater. Single water replenishment up to 20-40 ml. In addition, the focused eddy current field changes the potential distribution of cell membrane sections, affecting the cell between the electron and ion concentration, so that the distance between cells to expand, quickly open the skin water ion and water protein channels, effectively enhance the skin permeability and permeability Nature, instantaneous replenishment to the skin deep. Can give the skin oxygen, increase immunity. Oxygen injection, 3Pa pressure into the oxygen, improve dry and dry skin state. 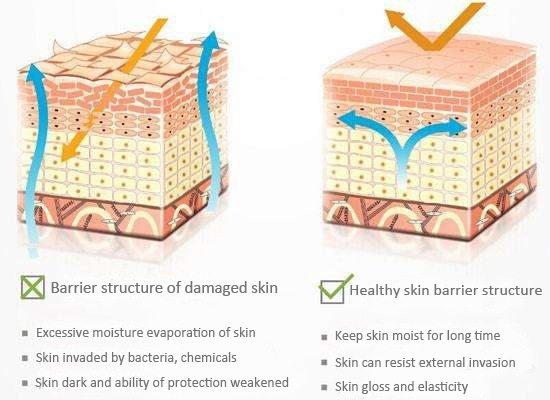 Promote the growth of skin cells, increase the number of layers of brick wall structure. 1.Ordinary RF and laser, like, act on the target tissue, the selective heating. Ordinary RF is the water molecules and other conductors to absorb energy, water molecules and other conductors to absorb energy, temperature, moisture vaporization, which can easily lead to dehydration of the skin dry, aggravating the symptoms of sensitive skin. 2.Ordinary RF output is based on a simple conduction current, the RF current must be transmitted through the conductor before the energy can be selectively absorbed. It produces Joule heat, easy to stimulate sensitive skin, sensitive skin intolerance thermal stimulation, easy to aggravate the symptoms of sensitivity. Frequency does not have this efficacy and physical properties, ordinary RF heat stimulation, increase the inflammatory response. 4. 27MHz eddy current field skin can affect the physical and chemical characteristics of calcium and potassium ion concentrations, a certain degree of calcium ion concentration can quickly repair the skin barrier function f ordinary RF does not have this function and physical characteristics. 5.SHUMIN STAR output displacement current, does not produce Joule heat, does not stimulate sensitive skin, easy to relieve the sensitive symptoms. SHUMIN STAR eddy current field using the role of skin tissue, skin tissue absorb energy without any selectivity. SHUMIN STAR is a high-tech medical equipment on the market that does not cause water shortage and replenishes the skin. Medication temporary solution, the patient is not satisfied. Hormones are skin opium.